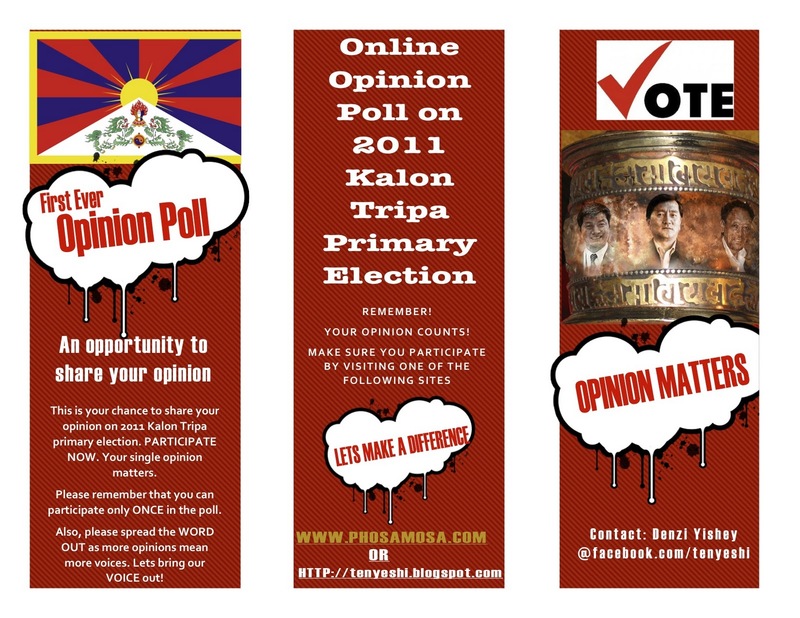 Following the official announcement of final three Kalon Tripa candidates by the Election Commission on Jan 19, 2011 and the voter registration window now being closed, I decided it’s the right time to launch the online opinion poll on 2011 Kalon Tripa primary election. As you may be aware, the key purpose of this online poll, as with other opinion polls, is to provide an online forum for Tibetan electorates to share their opinion and to generate statistical data based on their shared opinions for analysis. To participate in the poll, you must be a Tibetan and a registered voter. The poll is designed to restrict participants from taking more than one poll. In other words, you can participate only ONCE in the poll. Please complete the poll by its closing date i.e., March 10, 2011. The poll is expected to take only about 2-3 minutes of your precious time. Click on the link to go directly to the online poll. https://survey.uwyo.edu/TakeSurvey.aspx?SurveyID=m6KI953ML. Please be assured that all of your responses will be anonymous. You are not required to identify yourself at any point of the poll. If you have any questions or feedback, feel free to contact me. Also, please inform or share this poll to all your friends and colleagues. As you can understand, a higher response rate will help to achieve closer results and analysis. If you are interested in knowing more about the last opinion poll and the procedures I followed for this poll, please read the following section. 1. To check the “Results and Analysis” (including the limitations) of my last online poll on 2011 Kalon Tripa election, please click this link http://www.facebook.com/note.php?saved&&note_id=490968904012#!/notes/denzi-yishey/results-and-analysis-online-opinion-polls-on-2011-kalon-tripa-final-election/464761934012. 2. On December 29, 2010, I shared a note on, “Planning, design and implementation: Second/final phase of online opinion poll on Kalon Tripa primary election” to call for volunteers. In that note, I shared my interest to work on one of the limitation of online opinion poll i.e., lack of participation from Tibetan who lacks basic skills in computer and English language. Regretfully, there was not a single volunteer. To read this note, click on this link http://www.facebook.com/note.php?saved&&note_id=490968904012#!/note.php?note_id=479430629012. 3. Before I launched this online poll officially on Wednesday Jan 26, 2011, I tested the questionnaire items with my Facebook friends to ensure its validity and reliability. I am grateful for their suggestions, some of which I incorporated into this poll. Here is a link of the test note http://www.facebook.com/note.php?saved&&note_id=490968904012#!/note.php?note_id=492258914012. 4. 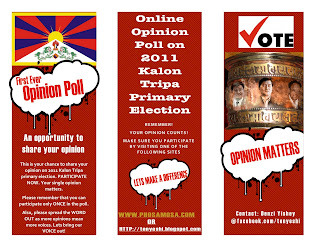 I am planning to reach as many Tibetan electorates as possible for this online opinion poll. I will be shortly sending some fliers to all the major Tibetan settlements, colonies, monasteries, high schools, and hostels. I am also planning to send an e-mail copy of the flier to all the Regional Tibetan Youth Congress based outside Tibetan settlements such as Chennai, Bangalore, Mysore, Baroda, Chandigarh, etc. If you have any contact in India, Nepal, Europe, or anywhere, I would love to communicate with him or her for a small help with flier. 5. If any of you are interested in analyzing the poll data, I am willing to share the data after March 10, 2011. Please let me know by March 5, 2011 with your e-mail address and a short description on how-to of your analysis. 6. I sent an email to the Election Commissioner, Central Tibetan Administration, Dharamsala, India on Jan 23, 2011 to inform about this personal online poll initiative. 7. On a final note, I am still thinking of an EXIT POLL on March 20, 2011. However, I need several volunteers from some of the key polling areas. If you are interested in volunteering, please feel free to contact me. I am more than willing to provide you with the tutorial and questionnaire items to ask.